Do you want to get more involved in Democratic politics? 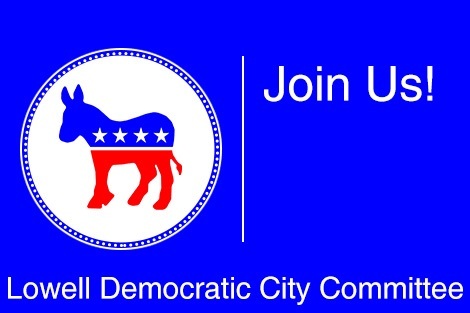 One way is to join us as a member of the Lowell Democratic City Committee. Lowell’s city committee is comprised of 11 ward committees, each of which can have 21 elected members plus others who are elected officials or members of the State Committee. On April 9, 2018, we will reorganize, meaning the city committee and each ward committee will elect officers for two-year terms. Ward committees will also vote to elect new members, one of which could be you. Here is Section I from the Massachusetts Democratic Party regarding local committees. Town, ward and city committees are the foundation of Party organization and have the closest contact with the people. The local committees shall conduct, according to duly established and recorded local bylaws, such activities as are suitable for a political organization; among which (without limitation) are: the endorsement of enrolled Democratic candidates in partisan and nonpartisan primaries, preliminaries and elections; financial support of the State Committee and Democratic nominees; the adoption of resolutions and platforms; the raising and disbursing of funds for political purposes; voter registration campaigns; and the calling of caucuses for the purpose of endorsing candidates, adopting resolutions, or conducting other Party business as provided for in the Call. All local committees are intended to be working committees, dedicated to the cause of winning elections. All members should pledge a minimum ofs 40 hours in each two-year election cycle to organizing or soliciting financial or grassroots voter support for Democratic candidates, at least half of which shall be in the general election time period. Now more than ever it’s important for all Democrats to band together to promote Democratic ideals and candidates. If you’re a registered Democrat in Lowell, we want your input and need your help. Please join us! The reorganization meeting will be April 9, 2018, East End Social Club, 15 W 4th St., 7 p.m. If you have any questions, contact your ward chair or contact me: judithdurant1@comcast.net. I look forward to welcoming you to the committee! The Policy and Outreach Committee of the Lowell Democratic City Committee presented a policy/platform for adoption at the February 26, 2018 meeting. The Massachusetts Democratic Party Charter calls for, among other things, “the adoption of resolutions and platforms” by City, Town and Ward Committees. The National Democratic Committee adopts a platform for all Democrats. State committees adopt a platform that is in sync with the national platform, but one that is focused on the specific needs of their state. A city committee then creates a policy that is in sync with the state platform, but one that is focused on their own community. The Democratic Party has members from many walks of life, varied economic states, and widely different life experiences. This leads to a wide swath of political views. Our goal as Democrats should be to focus on our agreements and set policies and support candidates that align with those things that we agree on. We hope you will consider joining us and helping us with this work. “Like” our Facebook page @lowelldems to get notifications of meetings and events. 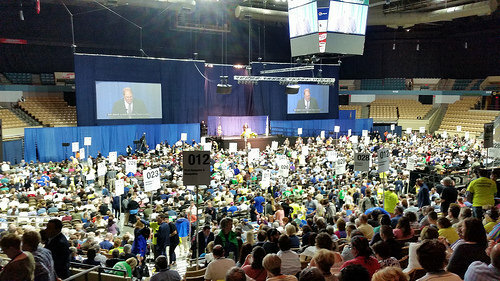 What happens at the Massachusetts Democratic Convention? Can anyone attend? What is a caucus? These are questions I asked myself before I became a member of the Lowell Democratic City Committee. I still have some questions, but I have now attended several conventions and generally understand how it works. This year’s State Convention in June is a nominating convention, meaning there are several statewide offices that candidates will be running for. And while the Democratic candidates that make it to the final ballot will be decided by a primary election in September, one Democratic candidate will earn the endorsement of the Party at the convention in June. Who’s Running for Statewide Office? Elizabeth Warren is running for a second term as senior U.S. Senator from Massachusetts. As of now there is no other Democrat running for this seat. Jay Gonzalez, Bob Massie and Setti Warren are all running as Democrats for Governor of the Commonwealth, and one of them will ultimately be chosen to run against Governor Baker. Quentin Palfrey and Jimmy Tingle are running for Lt. Governor, and one of them will share the ticket with whoever becomes the Democratic candidate for Governor. William Galvin is running to keep his seat as Secretary of State. He is being challenged by Democrat Josh Zakim, a Boston City Councilor. Attorney General Maura Healey is running for a second term and Massachusetts Attorney General. At this time there is no other Democratic candidate. Massachusetts State Treasurer Deb Goldberg is running for reelection. There is no Democratic challenger at this time. Massachusetts State Auditor Suzanne Bump is also running for reelection without a Democratic challenger at this time. On February 3, 2018, the Lowell Democratic City Committee will hold a caucus. It will take place at the Freshman Academy cafeteria, 40 Paige Street, at 1:00. At this caucus, delegates and alternates will be elected to attend the convention for the purpose of voting to support their selected candidates. Any registered Democrat can attend the caucus and run for a delegate spot at the convention or to vote for someone else to have a delegate spot at the convention. You’ll need to know in which Ward you are registered to vote, although if you don’t know, we will be able to find that information for you. Each of Lowell’s eleven wards will be allowed a predetermined number of delegates and alternates—this allowance is determined ahead of time by the Massachusetts State Democratic Committee. You show up at the caucus, check in, then find the table where your ward is meeting. If you want to run as a delegate or alternate, you’ll need to sign in stating same. You’ll need to be nominated to get on the ballot. You can ask someone to nominate you, or you can nominate yourself. You will be given a minute or so to introduce yourself and say why you want to be a delegate. All registered Democrats from you ward in attendance will vote on each nominated candidate. And thus each ward will choose its allotted number of delegates. Because this is a nominating convention, there will be competition for delegate spots. Candidates who hope to be on the ballot already have people working on their campaigns who are actively seeking registered Democrats in all wards to run as delegates for the purpose of getting their candidate as many votes as possible at the June convention. Even if you do not want to run as a delegate, you can help decide who will represent your interests at the convention. Attending the caucus is a great way to see firsthand how this aspect of party politics works and by participating you can have more of a voice in who gets elected. We hope to see you on February 3.